Did you know that red was the first color after black and white to be named? It has been found in cave paintings dating from 15,000 B.C., is the most frequently found color on national flags, and is rife with symbolism (the Red Scare anyone?). Here, we offer a look at residences that make the most of the bold hue. 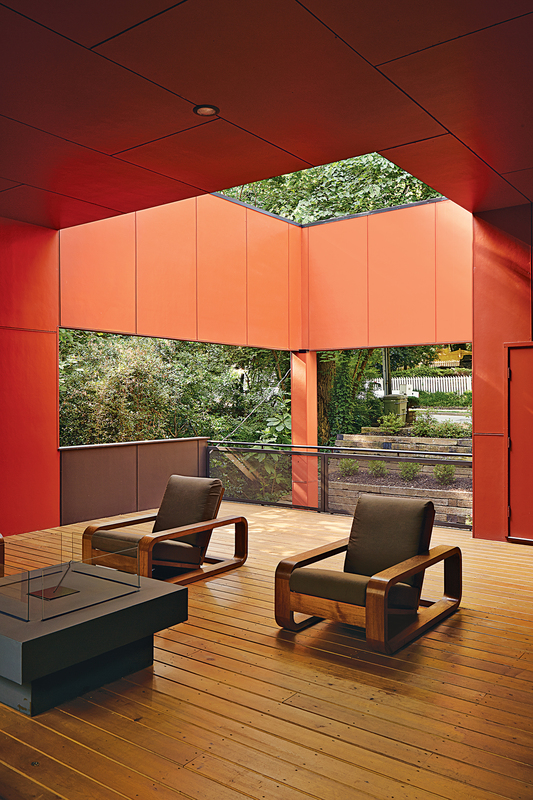 Clad in red-painted, fiber-reinforced concrete panels, a creekside home in Atlanta, Georgia, pops against the surrounding greenery. At night, actor Vincent Kartheiser uses a bright red curtain to cordon off a drop-down bed from the rest of his compact, 580-square-foot Hollywood abode. A candy-striped wardrobe turns the entryway of a renovated Belgian factory into a bright and playful space. A modern home in Lima, Peru, snakes its way through a tree-studded garden full of suprising features, such as a bright red open staircase. The walls are covered in Graniplast, a tinted acrylic finish, which was picked out by Nathan Pereira Arquitectos y Diseño. Red powder-coated Lucy chairs from Bend complement the warm wood finishes in the kitchen of a modern Chicago home. The owners of a geometric desert home in Phoenix, Arizona, decided to keep a set of bright red stools that belonged to a previous resident. They add a splash of color to the otherwise muted living-dining area. A Polder sofa by Hella Jongerius for Vitra brings out the warm tones in the brick- and wood-clad interior of a summer retreat in Norway. The stairwell is the bright core of a minimalist house in Washington. Inexpensive metal railings are set inside and painted the same red to disappear into the stairwell. When residents want privacy (from the outside world or from other family members), sliding curtains, like this one dividing the office from the staircase, create temporary walls between rooms. By inserting a tunnel made from 36 reclaimed commercial doors and tearing down a handful of walls, LOT-EK and contractor Andreas Scholtz brought light into the formerly unused dark hallway in a New York City apartment. The glossy Safety Red paint by Benjamin Moore catches the light by day but “becomes a richer, darker, very relaxing red at night,” resident Jorge Fontanez says. The reused doors serve as more than floor, walls, and ceiling; several are still functional. In the dining room, the benches lift up for storage, and doors on either side of the banquette open to reveal closets. A bright red pendant illuminates the dining room of a green loft renovation in Brooklyn, New York. The most prominent design elements in this former restaurant, punk rock night club, and furniture warehouse turned house in Los Angeles are the 14-foot-tall ceilings painted bold green, red, orange, and blue, and the golden southern light that flows through the double-hung windows, some of them new, some of them originals buried under decades of stucco and drywall. The bathroom of a modern southwestern abode retains the spirit of Arizona heat with its shocking magenta ceilings, floors, and walls. The vanity is anything but—opting for art instead of a mounted mirror—and is made from sanded and sealed oriented strand board (OSB), a waste material typically used in framing. Architect Jayna Cooper kept the fixtures rather humble in her affordably designed modern house that cost just $200 per square foot, but she did run a splashy red motif throughout. The pillars make a statement with Painter’s Choice Gloss Apple Red. Architect David Sarti used cement board to clad his Seattle home. Painted red and buffered from the walls of the house with a complex flashing system, the boards give the house a geometrical depth, as well as shielding it from the seemingly constant rain. An extra-long strand of extension cord from Ikea adds as a high-impact and low-cost lighting flourish to this Toronto Tudor renovation. A red wooden ladder and door mat provide vibrant contrasts to the charred facade of a Norwegian vacation house. Photo by Gregory Miller. Image courtesy of Gregory Miller .